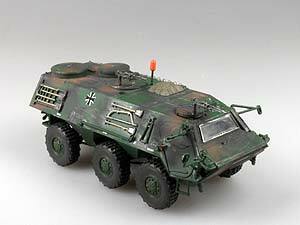 The depicted Fuchs 1 A4 is a transport and support vehicle for engineer groups. It is allocated in the Engineer battailons and independent Engineer companies. It has room for 8 soldiers in the back and two at the front. It carries engineer material as barbed-wire, mines, directional mines, etc. The A4 can be distinguished by the two round barbed wire roll containers on the rooftop.